Read the full transcript on the Heinz Marketing blog starting Mon. 10/29/18 - 6am PST. 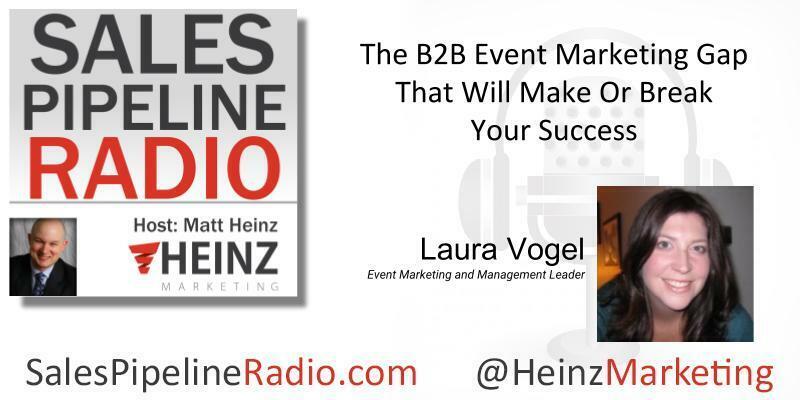 Another great episode, "The B2B Event Marketing Gap That Will Make or Break Your Success." Matt Heinz talks with Laura Vogel. "....a lot of event managers these days ... are great at being able to produce an event. But that's just step one. And what they really have to do is get butts in seats. ... how do we get the people there? How do we make sure we've got 2000, 3000, 5000 people in the room because what's really happening is you think about the spring or you think about the fall, especially if these are marketing events, there has never been more competition than there is today. "...So the number one thing I tell people is they have to really start with their marketing campaign when they start thinking about their content. I think what people tend to do is they start thinking about the marketing far too late in the game, and they really have to take it way back. And it really starts to happen when they're thinking about their content which tends to come first. They start thinking about their content a year in advance and they say, "okay, what's going to be our theme?" "How are we going to create our agenda?" And "How are we going to do those things?" When you do that, that's when you're thinking about your marketing. Because those two things go hand in hand. Listen in to also hear about the importance of the website and networking and more! I want to give a huge shout out to our sponsor, MailTag.io. It’s a super helpful tool that I highly recommend if you’re in sales because you can receive real-time alerts, right on your desktop, as soon as your prospects open your emails or click links within your emails.